when flying over long distance. Will sometimes soar. Voice: A deep, monotonous "oohu-oohu-oohu". The female's call is slightly higher than the male's. When threatened, they may bark and growl. 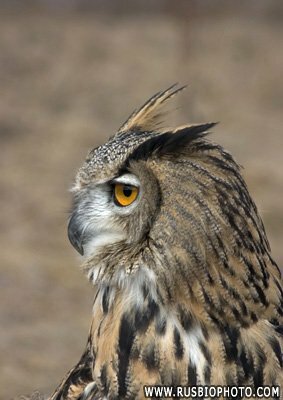 Eagle Owls occupy a variety of habitats, from coniferous forests to warm deserts. Rocky landscapes are often favoured. Adequate food supply and nesting sites seem to be the most important prerequisites. 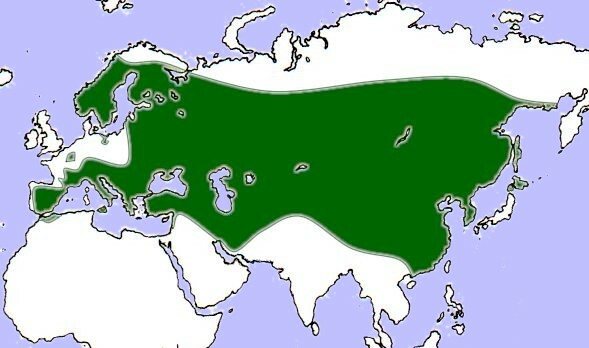 Distribution: North Africa, Europe, Asia, Middle East. 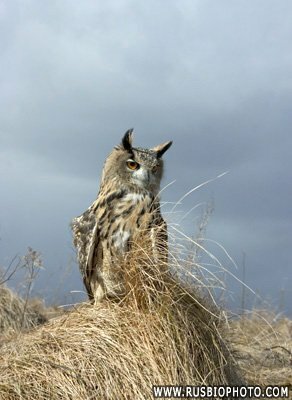 Eagle Owls have various hunting techniques, and will take prey on the ground or in full flight. They may hunt in forests, but prefer open spaces. 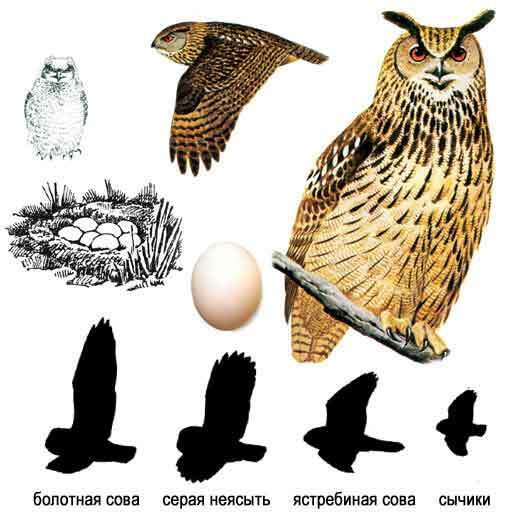 Eagle Owls will eat almost anything the moves - from beetles to roe deer fawns. and even other birds of prey (including other owls). In some coastal areas, they have been known to feed mainly on ducks and seabirds. Other prey taken include snakes, lizards, frogs, fish, and crabs. by scratching a shallow depression at the site and emitting staccato notes and clucking sounds. 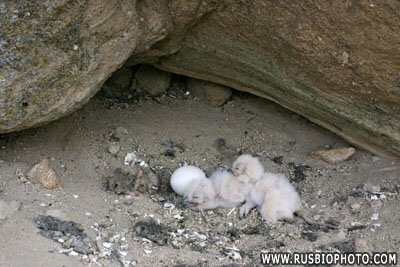 Favoured nest sites are sheltered cliff ledges, crevices between rocks and cave entrances in cliffs. 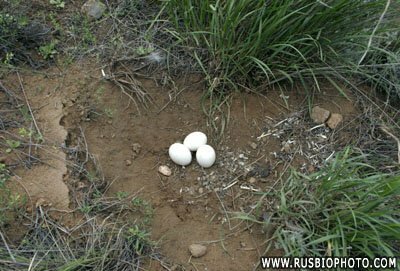 They will also use abandoned nests of other large birds. under fallen trunks, under a bush, or even at the base of a tree trunk. No nesting material is added. Very often pairs for life. They are territorial, but territories of neighbouring pairs may partly overlap. Laying generally begins in late winter, sometimes later. and weighing 75- 80g (2.6- 2.8oz). starting from the first egg, for 31-36 days. During this time, she is fed at the nest by her mate. the female stays with them at the nest for 4-5 weeks. and the female feeds small pieces the young. At 3 weeks the chicks start to feed themselves and begin to swallow smaller items whole. 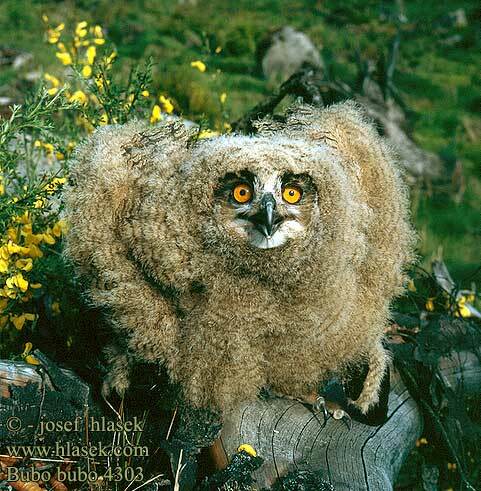 At 5 weeks the young walk around the nesting area, and at 52 days are able to fly a few metres. while elevated nests are left at an age of 5-7 weeks. and leave the parents' territory (or are driven out by them). At this time the male begins to sing again and inspect potential future nesting sites. Young reach maturity in the following year, but normally breed when 2-3 years old. 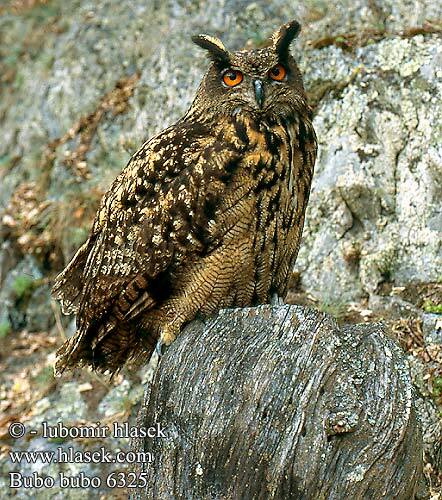 Eurasian Eagle Owls may live more than 60 years in captivity. In the wild, about 20 years may be the maximum. and shooting are the main causes of death.